The P116 dry-type filter provides oil-free air and high efficiency filtration of fine particles. It is often used as final filter in multi-filter systems. The filter is manufactured from a special polyester media. P116 panels are available in 2” or 4” thicknesses. Enclosing channels are 16 gage hot dipped galvanized steel. Filter media is encased between 2 layers of 3x3 galvanized wire cloth. Bail wire folding handles are provided when specified on the order. Efficiency: Standardized laboratory test on the P116 panel indicate virtually 100% arrestment of particles 7 microns in size and over 90% arrestment of 3 micron particles. 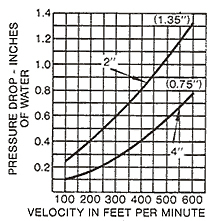 Resistance: When clean, resistance to airflow through a 2” thick P116 is .25 H 2O @ 100 fpm and 1.1” H 2O @ 500 fpm. Through a 4” thick panel resistance is .15” H 2O @ 100 fpm and .60” H 2O @ 500 fpm. P116 filters are available in production quantities in any rectangular size up to 1050 square inches and/or a maximum length of 35 inches. 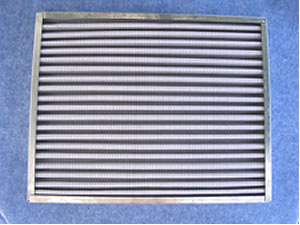 P116 filters can be cleaned with compressed air or a commercial dry cleaning solvent. The P116 can also be washed in clear water, or a solution of water and a mild detergent. Filters should be completely dry before placing back in service.